KABUL: More than 50 senior Taliban commanders were killed in an artillery strike on a meeting in Afghanistan’s southern province of Helmand, a US military spokesman said on Wednesday, as fighting continues across the country. The attack on a meeting of commanders in the district of Musa Qala in Helmand, one of the heartlands of the Taliban insurgency, was a significant blow to the insurgents, said Lt Col Martin O’Donnell, spokesman for US forces in Afghanistan. 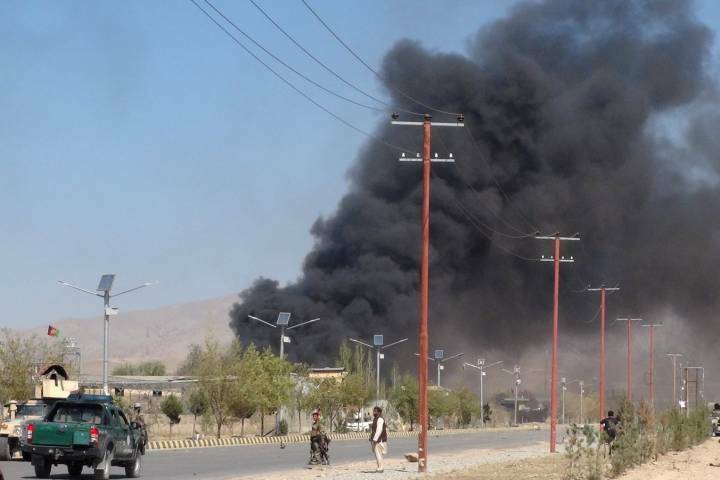 “This was a civilian residential area, which had no connection with the Taliban,” spokesman Qari Yousaf Ahmadi said in a statement. The US military said the May 24 meeting involved commanders from different Afghan provinces, including neighboring Farah, where Taliban fighters briefly threatened to overrun the provincial capital this month. “We think the meeting was to plan next steps,” O’Donnell said. While the strike by an artillery rocket system would disrupt Taliban operations, it would not necessarily mean any interruption to the fighting, he said. In Loghar province, east of the capital Kabul, the Taliban claimed an attack on a police station in the provincial capital Pul-e Alam which killed three police and wounded 12, among them four police and eight civilians. In a separate incident, A car bomb exploded near Afghanistan’s interior ministry in Kabul on Wednesday and then gunmen exchanged fire with members of the security forces, police said, in what appeared to be the latest in a series of militant attacks in the capital. There was no immediate word on casualties, nor was there any claim of responsibility. Two loud explosions and gunfire were heard coming from the vicinity of the ministry compound and police officials inside said they believed it was a militant attack. A senior police official said a car bomb was detonated near the ministry’s entrance and then a gun battle between attackers and members of the security forces broke out.